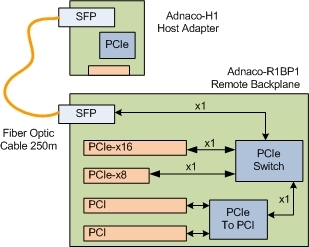 The Adnaco-S2 PCI/PCIe Expansion System allows system integrators to operate 2 PCI and 2 PCIe add-in cards over fiber optic cable at distances up to 250 meters from the location of the computer system. see Adnaco-S2A and -S2B for replacement. 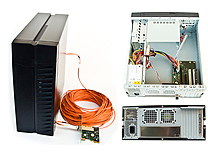 The Adnaco-S2 PCI/PCIe Expansion System allows system integrators to operate 2 PCI and 2 PCIe add-in cards over fiber optic cable at distances up to 250 meters from the location of the computer system. No additional host software drivers are required during installation or operation. Any type of PCI and PCI Express cards can be used including audio, video, graphics, USB, FireWire, SATA, data-acquisition, network and others. The System consists of a PCIe host adapter, a fiber optic cable, an expansion chassis. Adnaco Technology Inc. Copyright © 2006 - 2019 All Rights Reserved.